Last year we published a piece in the mag and online by this man here, Alex Gilmour. It was about how to be a better bartender by being all about the hospitality (and judging by the massive response online, you guys agreed). Gilmour was previously at Black Penny in Surry Hills, and now that he’s back from one of his many pilgrimages to Mexico, he’s taken on the bar manager role at the legendary Tio’s Cerveceria. 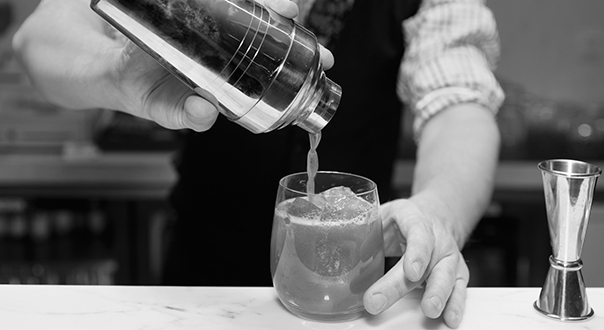 Here, he tells Sam Bygrave about his passion for all things agave, what really annoys him in a bar, and what it’s like to push agave in one of Sydney’s most talked about bars. I started drinking agave because it was always the thing that was left at a house party during school. No one else drank it. It was never goon, it was always spirits. I went travelling to South America — I worked in a children’s prison in Ecuador for a while. I started learning more about pisco, and aguardiente and South America in general. When I got back, I started uni and was working as a baker. I got back from another trip overseas and got a job at unibar. We went to Cafe Pacifico as a team outing and got shown how into it those guys were, and I generally kind of loved it. With my engineering degree, I did International Studies and had to spend a year overseas. I chose Mexico, and I chose Guadalajara, because it was just near the town of Tequila. I really got more involved in it, really started obsessing. And it took off. I didn’t get to Tequila as often as I wanted to when I was there, but I definitely drank a lot of it. I went to 400 Conejos, and started tasting mezcal there, but didn’t really associate what it was. When Cecilia Hoffman opened up El Rey, they were the first kind of mezcal discotheque bar, and I started to get more and more involved with it. I’ve always been more fascinated with spirits than anything else. I find that the intricacies and the histories behind them are more interesting for me. Which is why I then started my masters in brewing and distilling. I love the back stories behind things, and tequila really kicked that off. When Black Penny offered me a job it was about craft Aussie distillation, craft Aussie brewing, and that’s what I was really getting behind. I was still always an agave ambassador, if you will, and we sold a lot of tequila for a very small bar. I still remember people at Different Drummer coming and saying they drink whisky — awesome, do you want to try something a little bit sweeter from a different region? You pour it in the glass and they’re like, that’s dope! And it’s Sauza Tres Gen. That is tequila — Mexican whiskey! This is the first time I’ve had the chance to work with a venue that was dedicated on a single distillate. The boys, Jeremy and Alex know what they’re doing — they worked for Shady Pines Saloon, they’ve got strong backgrounds in training in bars. They were the first tequila bar to be doing 16 cases a week, the first tequila bar outside Cafe Pacifico. It was nice to come on board and not be told to shut up because I’m talking about tequila too much — it’s really nice. A lot of these brands I know, not just how they’re made, but I know who makes them, I’ve met a lot of these people, and that really excites me. I shouldn’t get better service than anybody else [in a bar] — that’s always something that has stuck with me. I don’t mind if the beer overflows a bit because it’s been popped too hard, I don’t mind if they haven’t got time for a hug over the bar. If I get a high five, that’s fantastic. But the thing that really annoys me is when people don’t say please or thank you, and that comes from both sides [of the bar]. It’s so simple, and it’s one of those things that was drilled into me as a kid I guess.